Like many GeekMoms, when Williams Sonoma came out with the Star Wars cookie cutters I was there when they opened the doors to get my hands on a set. We have made several batches of cookies since we got them but I came across a new and interesting way to use these cookie cutters. Wasting time searching the webWorking diligently on my article posts for GeekMom, I came across a nifty little site called Bento for Kidlet. Supermom Jen makes bento lunches for her son and has some fantastic ideas. I was excited to try my hand at these fancy little sandwiches. 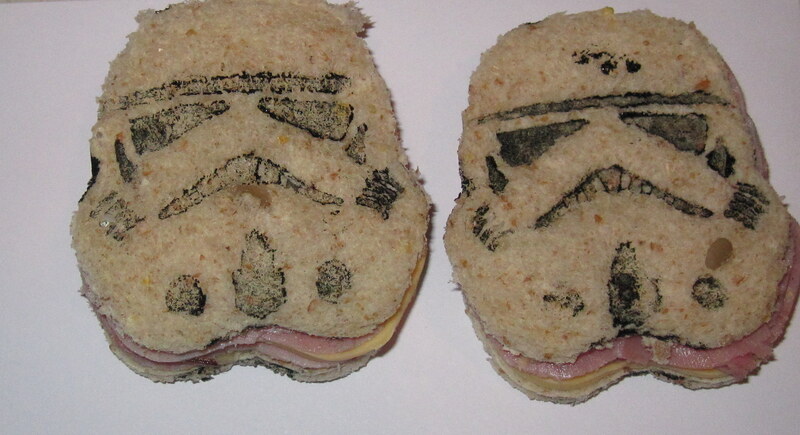 Here is how I made my Stormtrooper sandwiches. You can use your choice of fillings. I took the cookie cutter and cut the meat and cheese first. I tried imprinting the cheese with the face but it didn’t take. Maybe I didn’t press hard enough. Fold your paper towel into quarters and spread a good amount of black food coloring. Take the cutter and gently push down the back so the facial features get some black on them. Then take a piece of bread, press the cutter into it to cut the shape and then gently press the spring down to impress his features. It worked pretty well. You end up with left over meat, cheese, and bread but I just saved those for future use. It made a great surprise for Geekettes lunch box. Having made my first bento type sandwich, I was surprised to learn that bento has quite the following. They even have cute little things you can add to the food. Uh oh, I feel an obsession coming on. Here are couple of other sites with fantastic ideas. I only wish I was this creative! Another Lunch has a FAQ and tutorials on how to get started in the business of Bento. Hawai’i’s Bento Box has more cute ideas for bento boxes. Lunch in a Box has recipes and links on where to buy items. BentoLunch has tons of pictures and ideas as well. ← Learn How to Rule the World With Vordak: The Incomprehensible!